Toyota Industrial Equipment Manufacturing, one of the first Japanese companies to locate in Columbus, threw a party to mark a milestone. 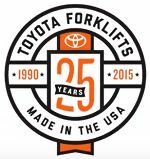 In its first 25 years in the city, Toyota has produced a half-million forklifts. Since its Columbus debut, the plant has become the biggest forklift producer in North America. Toyota’s campus at 5555 Inwood Drive, about 6 miles south of downtown Columbus, opened in 1990 and has gone through at least a dozen expansions since then. The company, which builds three- and four-wheel forklifts and other equipment, has grown from about 250,000 square feet when opening to just over a million square feet with an upcoming expansion. More than 1,100 employees work in the manufacturing facility, with several hundred more based in sister companies on the same Columbus campus. The company shut down its manufacturing facility Thursday morning to allow its workers to attend the celebration. Their presence also provided Toyota a chance to show how secure the local jobs are. A show of hands indicated that nearly half of the Toyota Industrial Equipment Manufacturing workers attending the celebration had been with the company at least 10 years. Many area residents may not realize Toyota has more than just a forklift manufacturing plant that has produced more than 500,000 forklifts since the facility opened. For the corporation, its latest expansion in Columbus will provide a new national headquarters for Toyota Material Handling North America — the sales, marketing and distribution arm of the material handling business. Toyota Industrial Equipment Manufacturing, the manufacturing arm of the material handling business, employing about 1,100 workers. Toyota Material Handling USA, Inc., sales, marketing and distribution arm of the material-handling business, employing about 175 workers. Toyota Industries North America Inc., an American holding company providing shared professional services to all North American entities of Toyota Industries Corp. with about 30 workers in the fields of information technology, accounting/finance, tax, internal audit, legal and human resources. Toyota Material Handling North America is the management framework for operational control of the material handling business in North America, which includes six executives. The anniversary celebration began with a ceremony and ended with a pig roast and concert – see for yourself in this video. During the anniversary ceremony, TIEM received various gifts including three large paintings from TMHU and the Toyota Dealer Network. The paintings will be placed in the new TIEM lobby following completion of the new expansion.